If there’s one thing freaking out Americans out right now, it’s Ebola. A poll just released by the Harvard School of Public Health found that 26 percent of Americans believe someone in their family will get sick with the virus in the next year, and close to 40 percent of us believe the country is destined for a major Ebola outbreak. Never mind that there have been exactly zero transmitted cases domestically and the virus is actually pretty hard to contract. Ebola is clearly on the brain. And that means retailers are on the job. You can always count on commerce to reflect our various national moods, and as a canvas of the Web proves, Ebola is no exception. Fear and fascination with the disease—which has killed over 1,400 people, but none of them in the U.S.—has spawned any number of Ebola-related products, ranging from the humorous to the ponderous to the pointless. Giantmicrobes Inc. in Stamford, Conn., is selling a plush Ebola toy, based on the virus’ distinctive, spaghetti-like profile, though it's taken the liberty of adding a face. Sales and marketing manager Nicole Centonze told Adweek that the Ebola toy has actually been in stock for several years, but “we have been getting more questions and interest in it, and we’ve seen a spike in sales online.” Who’d want to cuddle with an Ebola? Giantmicrobes usually contracts with pharmaceutical firms and hospital gift shops, but fears of the illness seem to have brought new customers. “I had a teacher contact me last week and say, ‘I’m going to do some special lessons, so I’ll get an Ebola for the class,’” Centonze said. The story’s much the same over at Infectious Awareables. 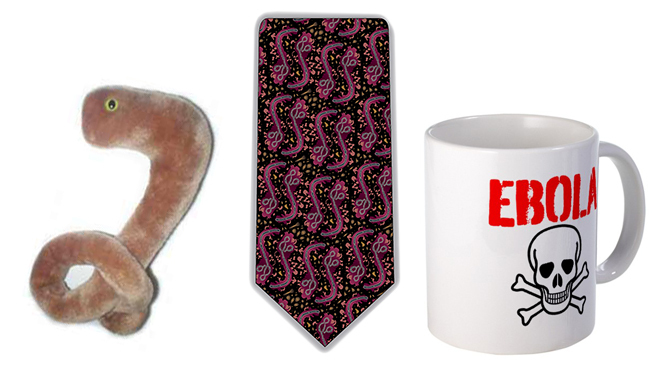 The Encino, Calif.-based company is selling four styles of its Ebola necktie, each featuring a colorful pattern based on microscopic images of the virus. Company president Roger Freeman was quick to point out the Ebola pattern (which, like Giantmicrobes’ ebola items, were in stock before the current epidemic started) is not meant to “trivialize issues and conditions that are both serious and timely.” Nevertheless, Ebola is undeniably topical. “We had a similar heightened interest during the 2001 Anthrax scare,” Freeman said. Meanwhile, other segments have seemingly scrambled to get Ebola-related goods online, just in time for the hysteria sale. At press time, eBay was offering a “Keep Calm It’s Only Ebola” T-shirt, and also something called a “pro-Kleenguard XP-Biohazard Ebola Protection Kit.” The $100 package features a disposable bunny suit, vented goggles, latex gloves and a medical-waste bag. A company called Current Clinical Strategies has an e-book titled Ebola Survival Guide, currently selling on Amazon for 99 cents. The book’s publication date was Aug. 13. Americans’ fears of contracting the disease have also led a number of unscrupulous online vendors to advertise Ebola cures—which do not, in any sense, exist. “Unfortunately, during outbreak situations, fraudulent products that claim to prevent, treat or cure a disease all too often appear on the market,” read an Aug. 14 advisory from the U.S. Food and Drug Administration, which has set up a website for customers to report any fake “cures” for sale. Yet of the 68 Ebola scares reported by the Centers for Disease Control and Prevention, none of them has turned out to be real. So relax, America, you don’t need Ebola protection equipment. But if you’d like a handmade pair of Ebola earrings, you can find them on Etsy.